This fun title written by is an account of the famed 1924 archaeological expedition at Giza, as told through the eyes of a fictional young boy invited to participate. 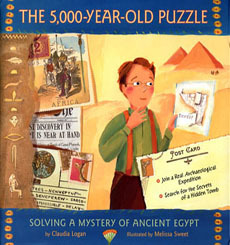 Logan works in a mystery, with the young boy helping the crew solve the mystery of a missing Egyptian mummy. The story provides an engaging window into what archaeological expeditions are really like (ie: the painstaking work!) The mystery is only partly solved in the end, which is fitting given that archaeological endeavors often produce more questions than answers. 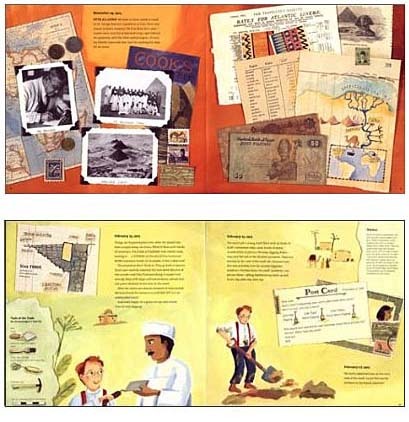 We LOVE the format--a mix of pretend postcards and journal entries, fact-filled sidebars, actual photos and newspaper accounts from the real Giza expedition, charming illustrations by Sweet. This book was a 2003 National Science Teachers Assoc Outstanding Social Studies Book! Below are sample pages from inside The 5,000-Year-Old Puzzle. 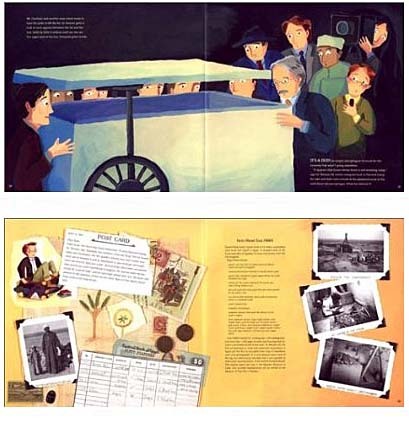 As you can see, some are laid out in scrapbook format (with documents, photos and drawings from the expedition), some feature one large illustration, and some are a little of both. All together, the presentation is fabulous and your students will definitely want 'solo reading' time to pour over the small details.